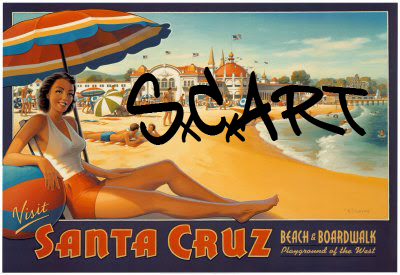 The Santa Cruz Art Conspiracy email list (SCART) is an email forum for announcing non-institutional art events, meetings and projects, ideas and news. It is a low-volume, moderated list sharing information about local Santa Cruz art topics only. Need to announce an art happening? Is it local to Santa Cruz? Is it non-institutional? Non-commercial? We prefer to focus on the cathartic process of creating art, collaboration and community, conceptional art and performance.